For other works based on the Pink Floyd album, see The Wall (Pink Floyd). The Wall – Live in Berlin was a live concert performance by Roger Waters and numerous guest artists, of the Pink Floyd studio album The Wall, itself largely written by Waters during his time with the band. The show was held in Berlin on 21 July 1990, to commemorate the fall of the Berlin Wall eight months earlier. A live album of the concert was released 21 August 1990. A video of the concert was also commercially released. The concert at a strip of land between the Brandenburg Gate and Leipziger Platz. 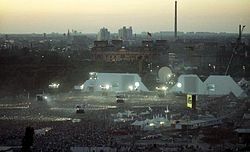 The concert was staged on vacant terrain between Potsdamer Platz and the Brandenburg Gate, a location that was part of the former "no man's land" of the Berlin Wall. "I did an interview a couple of years ago for a guy called Redbeard…" Waters recalled. "He said, 'Would you ever perform The Wall again on stage?' And I said, 'No'… Indoors, it made no sense financially; it's too expensive. And, as it's partially an attack on the inherently greedy nature of stadium rock shows, it would be wrong to do it in stadiums… I said, 'Well, I might do it outdoors if they ever take the wall down in Berlin. '… The Memorial Fund was in a council meeting, and felt they needed some kind of an event to focus attention on it… So I agreed to have a meeting with Leonard Cheshire. And I was very impressed, and said I would do what I could, although I thought it was very unlikely that it would come off… Then, in November , when the wall started coming down, we started negotiating." The show had a sell-out crowd of over 350,000 people. Right before the performance started the gates were opened which enabled at least another 100,000 people to watch. While this broke records for a paid-entry concert, seven days earlier Jean-Michel Jarre had set a new world record for concert attendance, with his free Paris la Défense show attracting a live audience of two million. The event was produced and cast by British impresario and producer Tony Hollingsworth. It was staged partly at Waters' expense. While he subsequently earned the money back from the sale of the CD and video releases of the album, the original plan was to donate all profits past his initial investment to the Memorial Fund for Disaster Relief, a UK charity founded by Leonard Cheshire. However, audio and video sales came in significantly under projections, and the trading arm of the charity (Operation Dinghy) incurred heavy losses. A few years later, the charity was wound up, and the audio and video sales rights from the concert performance returned to Waters. The production was designed by Mark Fisher and Jonathan Park. The stage design featured a 550-foot-long (170 m) and 82-foot-high (25 m) wall. Most of the wall was built before the show and the rest was built progressively through the first part of the show. The wall was then knocked down at the end of the show. Initially, Waters tried to get guest musicians like Peter Gabriel, Bruce Springsteen and Eric Clapton but they were either unavailable or turned it down. Both Rod Stewart, who was to sing "Young Lust", and Joe Cocker were confirmed to appear but when the original planned concert date was put back both were unavailable. Also, on the same 1989 interview with Redbeard, Waters stated that "I might even let Dave play guitar." On 30 June 1990 backstage at the Knebworth Pink Floyd performance at Knebworth '90, during a pre-show interview, David Gilmour responded to Roger's statement on an interview with Jim Ladd by saying that "he and the rest of Pink Floyd (Nick Mason and Rick Wright) had been given the legal go-ahead to perform with Roger but had not been contacted." Two days later, on 2 July 1990 Waters appeared on the American rock radio call-in show Rockline and contradicted his Gilmour invite by saying, "I don't know where Dave got that idea". Also Rush drummer Neil Peart revealed in a 2013 interview with Classic Rock Magazine that he tried to get involved to play drums but Roger turned him down in favour of Graham Broad. In the end, Hollingsworth (with Waters assisting) brought in guest artists including Rick Danko, Levon Helm and Garth Hudson of The Band, The Hooters, Van Morrison, Sinéad O'Connor, Cyndi Lauper, Marianne Faithfull, Scorpions, Joni Mitchell, Paul Carrack, Thomas Dolby and Bryan Adams, along with actors Albert Finney, Jerry Hall, Tim Curry and Ute Lemper. Leonard Cheshire opened the concert by blowing a World War II whistle. This performance had several differences from Pink Floyd's original production of The Wall show. Both "Mother" and "Another Brick in the Wall, Part II" (like in the 1980/81 concerts) were extended with solos by various instruments and the latter had a cold ending. "In The Flesh" (also like the 1980/81 concerts) has an extended intro, and "Comfortably Numb" featured dueling solos by the two guitarists as well as an additional chorus at the end of the song. "The Show Must Go On" is omitted completely, while both "The Last Few Bricks" and "What Shall We Do Now?" are included ("The Last Few Bricks" was shortened). Also, the performance of the song "The Trial" had live actors playing the parts, with Thomas Dolby playing the part of the teacher hanging from the wall, Tim Curry as the prosecutor, and Albert Finney as the Judge. The repeated proclamation of "Tear down the wall!" and subsequent destruction of the on-stage wall was for this show accompanied by a projection of a section of the actual Berlin Wall on the cardboard bricks used on stage. The show officially ended with "The Tide Is Turning", a song from Waters' then-recent solo album Radio K.A.O.S. The Wall's original closing number, "Outside the Wall," was affixed to the end of "The Tide is Turning." The Wall – Live in Berlin was released as a live recording of the concert, and the Laserdisc video in NTSC can still be found through second sourcing. A DVD was released in 2003 in the U.S. by Island/Mercury Records and internationally by Universal Music (Region-free). Hollingsworth's company Tribute, a London-based "good causes" campaign company, sold worldwide television rights, with 52 countries showing the two-hour event. Twenty countries showed up to five repeats of the show and 65 countries broadcast a highlights show. There was also distribution of a double music CD and post-production VHS videotape by Polygram. Roger Waters – vocals, bass guitar, acoustic guitar on "Mother", rhythm guitar on "Hey You"
The Rundfunk Orchestra, directed by Michael Kamen. The Marching Band of the Combined Soviet Forces in Germany (alternatingly credited on the 2003 reissue DVD as The Military Orchestra of the Soviet Army) and the Red Army Chorus. Before the beginning of the show, performances by The Hooters, The Band and The Chieftains (with guest James Galway) were held for 4 hours, but none of these songs were ever officially released. In the actual concert on live television, the second, third and fourth songs, "The Thin Ice","Another Brick in the Wall (Part 1)" and "The Happiest Days of Our Lives" were disrupted when a circuit breaker tripped. It was reset, but immediately tripped again so they had to rewire some equipment. Those three songs had to be re-recorded for the issue of the videotape. The live performance of "Mother" was also hounded by a power failure. Roger Waters tried to get Sinéad O'Connor to sing her parts anyway, or mime the song, while the error was being fixed. Offended by being asked to mime, she didn't return after the show to re-record the performance (which is how "The Thin Ice" was saved for the CD/Video release.) Instead, the release version of "Mother" comes from the dress rehearsal on the previous night before the concert. Consequently, the large projection of Gerald Scarfe's mother character that was projected on the screen during the concert cannot be seen on the video or DVD versions. Film director Ian Emes was hired to shoot live footage originally intended to be included in the program. Emes created a film about the character of Pink, performed by Rupert Everett, and of Pink's mother, played by Marianne Faithfull, and shot the sequences in East Berlin during the concert preparations. Only a small segment of the film was used in the performance. The Wife's part of "The Trial" was reshot at London's Brixton Academy after the original sequence was deemed to be of insufficient quality due to camera shake. What is seen in the video issue is a close-up of Ute Lemper, shot against a dark background, lip-syncing to the original live sound. Shot on Potsdamer Platz, the no man's land between East and West Berlin, the producers didn't know if the area would be filled with mines. Before setting up, they did a sweep of the area and found a cache of munitions and a previously unknown SS Leibstandarte Adolf Hitler bunker. At the request of the concert producers, part of the Berlin Wall was kept in place as a security fence behind the stage. During the final chanting of "Tear down the wall!" in the Trial sequence, the wall has a projection of a concrete and graffiti marked semblance of the Berlin Wall, just before it is torn down. At the beginning of "Bring The Boys Back Home", a section of the Vietnam War Memorial was projected onto the wall. The live Van Morrison version of "Comfortably Numb" is used in the Martin Scorsese film The Departed. It is later used in HBO's The Sopranos. Morrison also performed this version on his 2008 concerts. ^ Barton, David (5 August 1990). "Time Catches Up With "Pandemonium"". Sacramento Bee. ^ Jaeger, Barbara (10 August 1990). "Waters, Prince Heat Up August With New Albums". The Record (New Jersey). ^ Cross, Charles R. (2004). "Roger Waters". In Brackett, Nathan; Hoard, Christian (eds.). The New Rolling Stone Album Guide (4th ed.). Simon & Schuster. p. 864. ISBN 0-7432-0169-8. ^ According to Roger Waters' recollections in the documentary supplied with the DVD release of the film: "They stopped charging people when we got to 350–360,000, and like another 100,000 people came in..."
^ Lyall, Sutherland (1992). Rock Sets: the astonishing art of rock concert design: the works of Fisher Park. London: Thames and Hudson. ^ "ROGER WATERS, THE WALL BERLIN, 1990". StuFish Entertainment Architects. Archived from the original on 3 February 2013. ^ "About the Wall concert in Berlin". Rogerwaters.org. Archived from the original on 24 May 2012. Retrieved 13 March 2012. ^ Schaffner, Nicholas (October 1982). The British Invasion: From the First Wave to the New Wave. Mcgraw-Hill. p. 308. ISBN 978-0070550896. ^ den Uijl, Oscar. "The location of Hitler's bunker in Berlin". ^ "Roger Waters – The Wall – Live in Berlin". Australian-charts.com. Hung Medien. Retrieved 25 March 2013. ^ "Roger Waters – The Wall – Live in Berlin". Austriancharts.at (in German). Hung Medien. Retrieved 25 March 2013. ^ "100 Albums". RPM. 52 (23). 20 October 1990. ISSN 0033-7064. Archived from the original on 15 March 2016. Retrieved 25 March 2013. ^ "Roger Waters – The Wall – Live in Berlin". GfK Dutch Charts (in Dutch). Hung Medien. Retrieved 25 March 2013. ^ "Tous les "Chart Runs" des Albums classés depuis 1985 dans le Top Albums Officiel". InfoDisc (in French). Archived from the original on 20 August 2008. Retrieved 24 March 2013. Search for Roger WATERS and click OK.
^ "Top 100 Longplay". Charts.de (in German). Media Control. Retrieved 25 March 2013. ^ "Roger Waters – The Wall – Live in Berlin". Charts.org.nz. Hung Medien. Retrieved 25 March 2013. ^ "Roger Waters – The Wall – Live in Berlin". Norwegiancharts.com. Hung Medien. Retrieved 25 March 2013. ^ "Roger Waters – The Wall – Live in Berlin". Swedishcharts.com. Hung Medien. Retrieved 25 March 2013. ^ "Roger Waters – The Wall – Live in Berlin". Hitparade.ch (in German). Hung Medien. Retrieved 25 March 2013. ^ "1990-09-29 Top 40 Official UK Albums Archive | Official Charts". Official Charts Company. Retrieved 25 March 2013. ^ "The Wall: Live in Berlin – Roger Waters: Awards". Allmusic. Rovi Corporation. Retrieved 25 March 2013. ^ "ARIA Charts – Accreditations – 2006 DVDs". Australian Recording Industry Association. Retrieved 25 March 2013. ^ "Brazilian video certifications – Roger Waters – The Wall – Live in Berlin" (in Portuguese). Associação Brasileira dos Produtores de Discos. Retrieved 25 March 2013. ^ "Canadian album certifications – Roger Waters – The Wall – Live in Berlin". Music Canada. Retrieved 25 March 2013. ^ "Canadian video certifications – Roger Waters – The Wall – Live in Berlin". Music Canada. Retrieved 25 March 2013. ^ "The Official Swiss Charts and Music Community: Awards (Roger Waters; 'The Wall: Live in Berlin')". IFPI Switzerland. Hung Medien. Retrieved 25 March 2013. ^ "American video certifications – Roger Waters – The Wall – Live in Berlin". Recording Industry Association of America. Retrieved 25 March 2013. If necessary, click Advanced, then click Format, then select Video Longform, then click SEARCH. Wikimedia Commons has media related to The Wall - Live in Berlin.